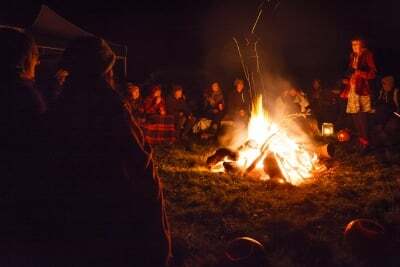 For Settle Stories’ Guy Fawkes Night event, Ghost Night, a bonfire took centre stage but the fireworks were—mostly—verbal. This was storytelling at its most stripped-down. With light coming only from the fire and the stars in the clear, cold November sky, there was barely even the sight of the storyteller to flesh out those most fundamental elements: voice and narrative. 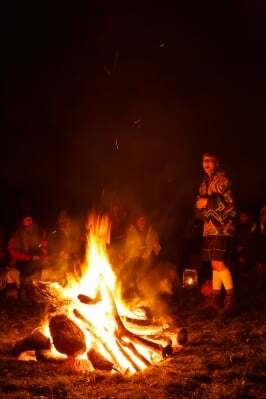 The fireside tale is perhaps the image we associate most with traditional storytelling, with wandering bards and with minstrels entertaining the revellers in the mead-hall. There is also a strong association between this turning of the season, as winter looms, and tales of the supernatural. Here, the smell of wood smoke, the crackle and the heat of the fire, the beauty of the open sky and the rhythm of the words feel primal, human and the best possible way to stand against the encroachment of the dark and the cold. Sita Brand, the driving force behind Settle Stories, made this link explicit with her opening tale about Paddy Aherne, a man shunned by the society he lived in because of his inability to tell stories. Paddy wanders the countryside, cold and soaked, before finding a remote house where an old man offers him food and shelter. However, as soon as he settles down for the night, he is beset by a violent group who force him to dig his own grave. He narrowly escapes before being forced to occupy it, and then wakes in the strange house—which disappears as soon as he leaves it. It has been a traumatic experience, but at last he has a story to tell! The other three performers on the night are graduates of Settle Stories’ training programme, The Storyteller’s Art, which ran for the first time in 2016. Sita Brand tells me that this course for storytellers aged 18-30 will run again in an expanded format next year, offering mentoring and masterclasses with experienced practitioners of the art. The first of the graduates tonight is Rachel Watson, an actress adding storytelling to her repertoire. Her supernatural tale is the modern and ultimately comforting story of artist, Kate, who is helped through a period of creative barrenness by a mysterious jigsaw that appears, piece by piece, in unexpected places. Mark Borthwick’s contribution to the first half of the performance derives from his native Edinburgh, with the story of seamstress living on Canongate. So enraged is she when her three sons refuse to help her in her work, instead going off to pursue their respective interests of dancing, drinking and love-making, that she murders them on their return and stitches together from their corpses what she hopes will be a more helpful, six-armed son. Unfortunately, the new son is so devoted to the craft that the mother meets a gruesome end. Bravely dressed in a kilt on such a chilly night, Borthwick is an engaging, accomplished exponent of many of the techniques of the tale-teller. Originating in the Netherlands, but based in Skipton, Patricia Stienstra closes the first half with a story set in northern Scandinavia. She picks up the myth of the ‘myling’, the soul of an unbaptised child forced to roam the earth until buried properly. Stienstra impressively takes in her stride the fact that a neighbouring farm chooses her story for the noisiest part of its firework display, but the tale is effectively and affectingly told. 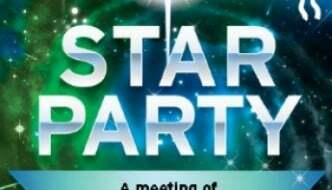 There’s a welcome interval with a barbecue and hot punch, before Mark Borthwick opens the second half with a traditional traveller’s story about a queen who is so distraught at the death of her husband and her son, that she is willing to sell her soul to the Devil in order to get them back. Of course, when they return, dead-eyed and skeletal, she realises her error, and is only able to keep her soul by a clever stratagem to outwit Old Nick. Sita Brand’s second tale, and the last on the night, is a rendition of Edith Nesbitt’s Man-Size in Marble, in which a wife pays the ultimate price for her husband’s scepticism concerning a legend about statues who come to life and walk on Halloween. The night finishes with a campfire song, as Mark Borthwick leads a round of the Ghanaian children’s song Senwa Dedende, to send us safely to our homes in the November night, in spite of all the supernatural activity. 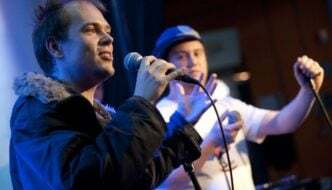 Settle Stories continues to find innovative ways to celebrate the tale, but this delightful event, by returning to the very roots of the storytelling tradition, was perhaps its most effective yet, and a wonderful showcase for a new generation of tellers. 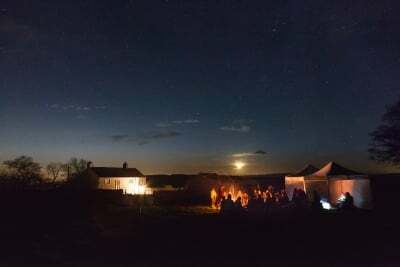 Details of future Settle Stories events, including the upcoming performance of The Shahnameh by Adverse Camber Theatre, can be found here. With light coming only from the fire and the stars in the clear, cold November sky, there was barely even the sight of the storyteller to flesh out those most fundamental elements: voice and narrative. The other three performers on the night are graduates of Settle Stories’ training programme, The Storyteller’s Art, which ran for the first time in 2016. Originating in the Netherlands, but based in Skipton, Patricia Stienstra closes the first half with a story set in northern Scandinavia. She picks up the myth of the ‘myling’, the soul of an unbaptised child forced to roam the earth until buried properly. 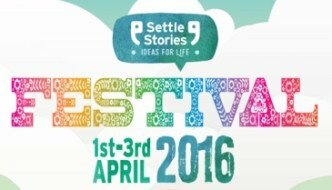 The Settle Stories Festival: Pioneering Storytelling in Yorkshire!